This site not responsible for information provided here by a third party. This information provided here with permission of the author. The Texas Company / Texaco Inc.
1. These notes consist of information which I (with appreciable assistance) have been able to piece together on the corporate history of INDIAN REFINING COMPANY, INCORPORATED, the origins of HAVOLINE Motor Oil, and (to a lesser extent) the history of The Texas Company / Texaco Inc. Emphasis was placed on INDIAN REFINING COMPANY, and on an accurate account of HAVOLINEs early days, since surprisingly little such information (especially on the "old INDIAN") is readily available elsewhere. They are by no means a comprehensive history of The Texas Company / Texaco Inc. but only attempt to cover those events which I believe were most relevant to the histories of INDIAN REFINING COMPANY and HAVOLINE Motor Oil. 2. I am aware that these notes conflict, in some details, with "The Texaco Story  The First Fifty Years 1902-1952" (Marquis James, The Texas Company, 1953) which has come to be viewed as the "official history" of The Texas Company. Based on information which I have verified through multiple, independent sources, however, it appears that portions of the material with which Mr. James was given to work were either erroneous or misinterpreted. 3. I am also aware that there are certain discrepancies between what is presented here and some of the information currently (March 2001) posted on the "www.havoline.com" website maintained by Equilon LLC. Here, again, I believe that the individual tasked with that project was given incorrect data - probably including the book by Marquis James, mentioned above. 4. It is recognized that "The Texas Company", "TEXACO", "HAVOLINE", "INDIAN", "FIRE-CHIEF", and "Sky Chief" are or were registered trademarks of Texaco Inc. They are used here for informa-tional and historical research purposes, only. These notes are in no way an official publication of Texaco Inc.
28 March 1901 The Texas Fuel Company is among some 200 companies organized in the days immediately following the famed oil strike at Spindletop Hill near Beaumont, Texas. The company establishes an office in Beaumont. 4 October 1901 John F. Havemeyer of Yonkers, New York incorporates The Havemeyer Oil Company under the laws of that state, for purposes (as detailed on its certificate of incorporation) related to "lubricating and all other oils of every kind and nature" (probably referring to whale oil, other animal renderings, and - possibly  to various seed oils, in addition to petroleum). 2 January 1902 The Texas Fuel Company begins business. 7 April 1902 The Texas Fuel Company becomes The Texas Company and incorporates under the laws of the State of Texas. 1 January 1903 "TEXACO" (having originated as the cable address of The Texas Company) is first used as a product name. 1904 The Havemeyer Oil Company - having developed a unique cold-filtration process and blending package for oils - coins, and first uses, the name "HAVOLINE". 1905 Realizing that the Jasper County, Indiana oil field which it originally intended to exploit is effectively depleted, Indian Asphalt Company is persuaded (in "an extensive campaign by the [Georgetown] Board of Trade") to move its offices and plant to Georgetown, Kentucky. 1 May 1906 Growing quickly in both size and scope, Indian Asphalt Company changes its name to INDIAN REFINING COMPANY. Its plant is upgraded to "refinery" status and its product line expanded to include paraffin wax, paint, and "Blue Grass"-brand axle grease, in addition to asphalt. Richmond M. Levering becomes the first president of the renamed company and is soon joined in business by his father and mentor - Indiana banker, financier, and entrepreneur J. Mortimer Levering - who becomes the companys secretary. 8 December 1906 "HAVOLINE" is registered as a trademark of The Havemeyer Oil Company for use as a brand name on oils (not strictly motor oil) and greases. 5 January 1907 Havoline Oil Company (a "spin-off" of The Havemeyer Oil Company) is incorporporated under the laws of State of New York. As with The Havemeyer Oil Company, its stated purposes include production, purchase, refining, sales, and other dealings involving "animal" oils and fats as well as "mineral" (i.e. petroleum) oils. 1907 Construction of INDIAN REFINING COMPANYs Lawrenceville, Illinois refinery is completed and the refinery begins operation. 1908 Although continuing to operate its Georgetown refinery, INDIAN REFINING COMPANY relocates its offices to Cincinnati, Ohio. The company also begins operation of a small refinery near East St. Louis, Illinois. 20 May 1909 As part of a program of rapid expansion, INDIAN REFINING COMPANY incorporates under the laws of the State of New York and purchases The Havemeyer Oil Company, Havoline Oil Company, and the by-now established "HAVOLINE" name (which is then registered as a trademark of INDIAN REFINING COMPANY as a brand name for lubricating oils - again, not strictly motor oil). 1909 Production of HAVOLINE products at the Lawrenceville refinery begins. 1 December 1909 Following a brief illness, J. Mortimer Levering (secretary of INDIAN REFINING COMPANY) passes away. 17 December 1909 The Havemeyer Oil Company is dissolved. 1909-1911 Also included in this period of INDIAN REFINING COMPANYs expansion are the purchases of the Bridgeport Oil Company (Bridgeport, Connecticut), the Record Oil Refining Company (Newark, New Jersey), and the control of a large storage station at Kearny, New Jersey. The company launches a program aimed at making a full-scale entry into the European market. 16 March 1911 Primarily in anticipation of expanding to the west coast, INDIAN REFINING COMPANY OF CALIFORNIA is created (and is incorporated under the laws of the State of New Jersey). 1 April 1912 INDIAN REFINING COMPANY OF LOUISIANA incorporates under the laws of the State of Louisiana. December 1913 - January 1914 In conjunction with a sweeping organizational and financial re-structuring, INDIAN REFINING COMPANY (Maine) applies for and receives "authority to do business" in the States of New York and California. It assumes those functions formerly performed by INDIAN REFINING COMPANY OF NEW YORK. The planned expansion to the far-West, however, is effectively cancelled and INDIAN REFINING COMPANY OF CALIFORNIA is dissolved. The companys president, Richmond M. Levering, resigns, as do several other senior officers. 1915 INDIAN REFINING COMPANY closes its Georgetown and East St. Louis refineries and the companys overly-ambitious European venture (which has proven to be a severe financial drain) is abandoned. December 1918 - January 1919 In yet another reorganization, INDIAN REFINING COMPANY OF NEW YORK, INDIAN REFINING COMPANY OF LOUISIANA, Havoline Oil Company, the Record Oil Refining Company, and the Bridgeport Oil Company - all subsidiaries of INDIAN REFINING COMPANY (Maine) (hereafter referred to simply as INDIAN REFINING COMPANY) - are dissolved. The New Orleans refinery is closed. 1920 INDIAN REFINING COMPANY purchases the capital stock of the Central Refining Company, which is located immediately north of the Lawrenceville refinery. The Central refinery facilities are ultimately reconfigured for lubricants manufacture. 1923 The general offices of INDIAN REFINING COMPANY are moved from New York City to Lawrenceville. 1924 INDIAN REFINING COMPANY sells its remaining producing properties (consisting mainly of wells and leases in Illinois and Ohio) to the Ohio Oil Company (later to become the Marathon Oil Company). 1924-1925 Wishing to more closely associate the two names, INDIAN REFINING COMPANY adopts a totally re-designed "HAVOLINE" trademark and virtually identical "INDIAN GAS" logo, both of which prominently feature the red-white-and-blue "ball" which had first been incorporated into the original "HAVOLINE" logo in approximately 1922. A "dot" is added to the middle of the "D" and above the second "I" in the word "INDIAN" (replicating the dots within the "O" and above the "I" in "HAVOLINE"). "INDIAN HI-TEST" gasoline is introduced on a limited basis. 1926 The subsidiary Indian Pipe Line Corporation is sold to the Illinois Pipe Line Company. May 1926 The Texas Company introduces "New and Better TEXACO Gasoline". 26 August 1926 The Texas Corporation is incorporated under the laws of the State of Delaware and, by exchange of shares, acquires substantially all outstanding stock of The Texas Company (Texas). 20 April 1927 The Texas Company incorporates (under the laws of the State of Delaware) as the principal operating subsidiary of The Texas Corporation. All assets of The Texas Company (Texas) are transferred to The Texas Company (Delaware) and The Texas Company (Texas) is dissolved. The Texas Corporation becomes the "parent company" of the by-now numerous "Texas Company" entities and other subsidiaries. 2 March 1928 The Texas Corporation acquires the California Petroleum Corporation, which is reorganized as The Texas Company (California). 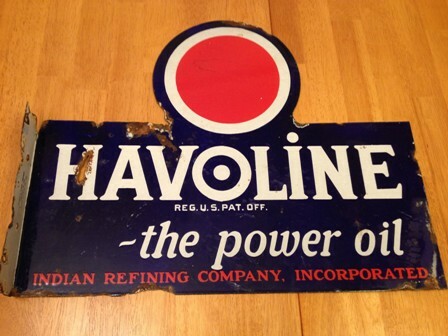 16 August 1929 Its chemists and engineers (led by Dr. Francis X. Govers) having perfected a revolutionary solvent-dewaxing process, INDIAN REFINING COMPANY introduces "HAVOLINE WAXFREE" motor oil, replacing "HAVOLINE the power oil" (which had, in approximately 1924, supplanted HAVOLINE IT MAKES A DIFFERENCE"). 1930 The Texas Corporation introduces "TEXACO Ethyl Gasoline" (which is renamed "FIRE-CHIEF Ethyl" 15 April 1932). 14 January 1931  15 March 1943 INDIAN REFINING COMPANY continues in operation as an "affiliate" of The Texas Corporation, although all sales outlets and company facilities and equipment are re-badged as "TEXACO". Production of "TEXACO" gasolines begins at the Lawrenceville refinery. "INDIAN" gasoline becomes a "sub-regular" (priced below "TEXACO" gasolines) and is added to the product line at most outlets, nation-wide. Production of "INDIAN" gasoline is included at other Texas Corporation refineries. (It is during this period that "INDIAN" pumps bear a distinctive plate - either round or rectangular - featuring an art deco Indian beadwork design.) National marketing and sales offices for INDIAN REFINING COMPANY are opened in Indianapolis, Indiana. 15 April 1932 "TEXACO FIRE-CHIEF Gasoline" is introduced. 1934 "HAVOLINE WAXFREE" is offered in refinery-sealed cans for the first time, and furfural solvent-extraction is added to the manufacturing process. 1935 Production of "HAVOLINE WAXFREE" at Port Arthur Works is begun in order to supplement the output of the Lawrenceville refinery. May 1936 "New TEXACO Motor Oil" (also produced with the solvent-dewaxing/furfural solvent-extraction process but with a totally different and less-expensive formulation than that of HAVOLINE) is introduced. 1938 "HAVOLINE  DISTILLED AND INSULATED" is introduced. October 1938 "TEXACO Sky Chief Gasoline" is introduced (replacing "FIRE-CHIEF Ethyl"). 1 November 1941 The Texas Company (California) is instructed to transfer all assets to The Texas Company (Delaware) and is then dissolved. The Texas Corporation "merges itself into" The Texas Company (Delaware). The Texas Company (Delaware) - hereafter referred to simply as "The Texas Company" - becomes the "parent company". 15 March 1943 INDIAN REFINING COMPANYs stockholders transfer all of the companys property and assets to The Texas Company in exchange for shares of that companys stock. The Texas Company discontinues "INDIAN" gasoline and all other use in trade of the INDIAN name. 30 April 1943 The Texas Company creates a second "Indian Refining Company", which it incorporates under the laws of the State of Delaware - a "shell" company which it lists as an inactive subsidiary. 1946 "New and Improved HAVOLINE" is introduced. 1950 "Custom-Made HAVOLINE" is introduced. Early 1950's Lubricants production at the Lawrenceville refinery is discontinued; the lubricants production facility is dismantled and portions of that area of the property are disposed of. 1953 "Advanced Custom-Made HAVOLINE" is introduced. 1955 "Advanced Custom-Made HAVOLINE Special 10W-30" is introduced. 26 August 1958 INDIAN REFINING COMPANY, INCORPORATED is officially dissolved by the State of Maine. 1 May 1959 The Texas Company becomes Texaco Inc.
New HAVOLINE cans are introduced. 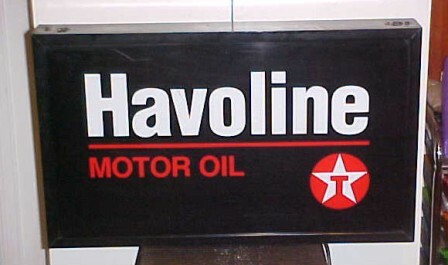 The "TEXACO" trademark replaces the INDIAN REFINING COMPANY-era red-white-and-blue "ball" in a totally re-designed "HAVOLINE" logo. 1980 For numerous reasons (among them the expense of needed technological upgrades), the prospects for the Lawrenceville refinerys future profitability have eroded significantly. Unable to establish what might be a viable alternative means of supplying product to the area, Texaco Inc. makes the decision to withdraw from the retail gasoline market in that portion of the upper Midwest traditionally serviced by Lawrenceville. 1982 The marking of all 55-gallon TEXACO drums becomes black with a red band. TEXACO oil drums had, historically, been gray with a green band with one exception: HAVOLINE drums had continued to be painted dark blue with a white band and head  Texaco Inc.s last remaining use of the colors of INDIAN REFINING COMPANY. March 1985 The diminution of reasonably-accessible sources of suitable crude, the ever-increasing costs of compliance with governmental regulations, and other business considerations combine to make continued operation of the Lawrenceville refinery economically unfeasible. Texaco Refining and Marketing Inc. (a recently-formed subsidiary of Texaco Inc.) completes the withdrawal from the retail and wholesale motor fuels market in a contiguous area spanning Illinois, Indiana, Kentucky, and Wisconsin. The Lawrenceville refinery is closed. 1. Texaco Refining and Marketing Inc. "sold" the idle Lawrenceville, Illinois refinery facilities to fellow Texaco Inc. subsidiary Indian Refining Company (Delaware) in 1988. In August 1989, follow-ing another change in ownership, both the refinery and Indian Refining Company (Delaware) were acquired by "second tier subsidiaries" of a Pennsylvania firm. The refinery was extensively re-furbished and put back in operation in November 1990. Unfortunately, it was again closed in September 1995, underwent subsequent changes in ownership and, as of this writing, is in the process of being dismantled. 2. While they were similar in name, were both associated with The Texas Company / Texaco Inc., and had a common place of business, there does not appear to have been a true lineal connection between the original INDIAN REFINING COMPANY, INCORPORATED and the second "Indian Refining Company" (a Delaware corporation). The property, assets and stock of the former had been transferred directly to The Texas Company before the latter was created, and the former was still in existence (albeit in "inactive corporation" status) for more than 15 years thereafter. All available information clearly indicates that the latter Indian Refining Company (Delaware) was a separate entity from INDIAN REFINING COMPANY, INCORPORATED and should not be confused with the "old INDIAN". UNTIL REPLACED BY RED-WHITE-AND-BLUE "BALL" IN 1922. POST-1909 PACKAGING ALSO MARKED "INDIAN REFINING COMPANY". 2. 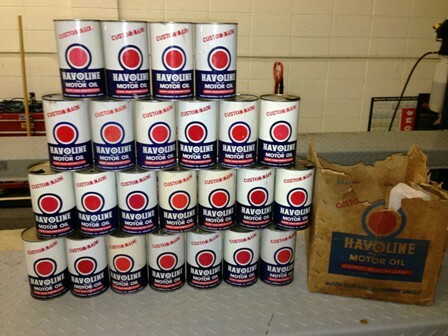 RED-WHITE-AND-BLUE "BALL" ON ALL HAVOLINE CONTAINERS AND MOST PACKAGING BEGINNING 1922. CONTAINERS WERE SQUARE OR RECTANGULAR AND HAD SCREW-ON TOPS.